I also crashed when collecting gifts but gifts still there when I back, and I found the gifts collecting time is so fast. The second time gift collection make a HALT so i slow my collecting speed and the MM no crash ^^"
Don't know isn't the cause (fast collecting) make MM crash? I was interested in seeing how many gifts my friends have sent, surprised to see friends marked "0". Does this counter only take account of how many gifts from their daily allowance have been sent, and not requested/wall gifts I wonder? Also I wonder where the "pillow" is? I did the update and now, game won't open. It tries, but, crashes before it opens. Anyone else having this problem? ♡MotherLove♡ wrote: I was interested in seeing how many gifts my friends have sent, surprised to see friends marked "0". Does this counter only take account of how many gifts from their daily allowance have been sent, and not requested/wall gifts I wonder? Also I wonder where the "pillow" is? Pillow in Friends list and at upper left corner of your friends' icon. Wonder how long is long for a friend to go to sleep? One pillowed friend of mine has been on vacation without internet for only 10 days. Thank you, I found a couple of friends with pillows.....though not the friends I expected I have a couple of friends who obviously haven't visited mm for many months, but I keep them as their yards are full of snatchins. No pillows on their icons strangely. I have been in process of actively managing friends lately to cull the list down to a level I consider manageable. The less active friends I have marked on my list were amazingly consistent with the numbers associated with their "gifting". I have 3 friends with pillows who I have noted have not played lately, so consistent there as well. Be cautious though...it was not 100% accurate, but close. Some friends had high gifting numbers but have not responded to my recent requests for items to assemble the island photo..so it could just be me they don't respond to! Also...have not had crashes, and accepting gifts is much faster. I play on a very old iPad 1' so even my old, tired tablet is ok so far. Has anyone tried to wake up a sleeping friend to see what happens? I suggest if you are vacationing and away from game, put a note on your wall! not sure the order -- was cranking through them pretty quick. These come after the ones mentioned, but I might have skipped one. anyone made it past the bunker portion??? I've banished tons, but can't seem to sway the mix of yard monsters at all. I've consistently kept 1 each of the 2 creatures related to each room. When you go into battle for the new room, you have to decide between Van Helsing or Euridice. Not sure what that affects -- but I picked Euridice. The first 3 take many hours to recharge, so you'll need several of the last two to get anywhere. 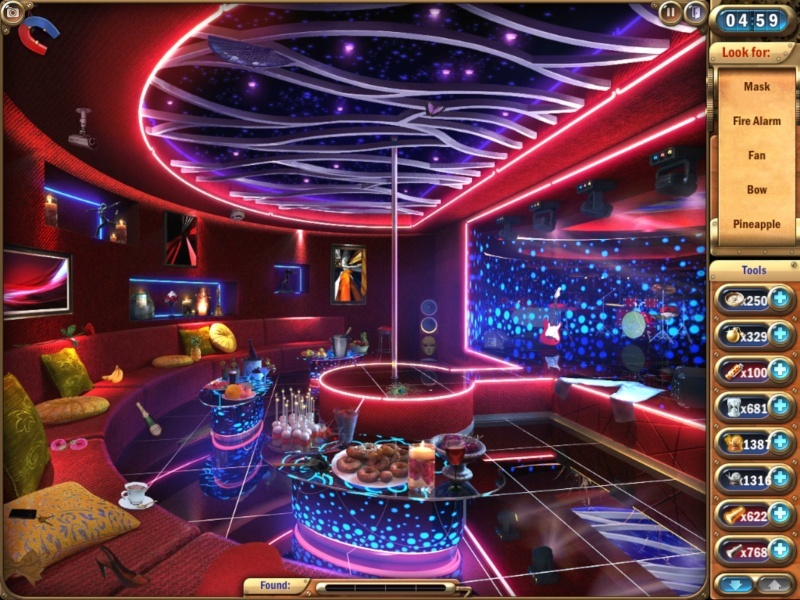 And for those who are curious -- here's a screen shot of the inside of the club. BE CAREFUL! All of my friends have PILLOWS! I know for a fact that a lot of them are active. If your looking to weed out inactives the 0 gift boxes are a pretty good indicator. What I do if I haven't seen them on my wall in awhile is post a friendly note on their wall to see if they are still playing or have left a vacation message. It is summertime after all. Having been playing since day 1 I have a huge amount of neighbors and need to go through them every so often. It takes a bit of time and I post about ten folks a week that I think have not been active. If I get no reply within a few days I try one more time then go ahead and delete them. Not sure this is the right place to post this but was surprised how many people didnt know this....Clear your wall messages! After you gift requests X out the message. You will see more requests pop up that were hidden before because your wall was full! I do keep some from my daily friends because it makes them easier to visit but clear the rest. I had over 18 months of chit chat to clear when I found out about this! It took awhile to get rid of em all and now I take care of it on a daily basis. Hope that helps someone else. WOW! Didn't know this either, I must have a bunch. So glad u posted this. My game keeps crashing since the new update. I'm trying to accept gifts, and crash, crash, 3 times. Game just closes. I have closed it out at bottom of iPad and restarted. Hope this is a temporary issue. Yes -- if you have 50+ wall requests pending, you may very well have hidden ones that have fallen behind discussion posts. I tend to check wall requests several times a day, even when I don't have time to play -- but when I'm too busy to do so, I also have to delete completed wall requests from the first half of my wall to get to the hidden ones below. I don't understand the new gift icons, I have friends with zeros whom I know have sent gift so me and I to them. I am afraid they ar inaccurate and useless. Also at the risk of sounding like a horrible prude, I think the 69 snatchins are tacky and in bad taste. I had a few. friends display with the pillow icon, and when I tried to visit them from my friend list, I got a message that I had to wake them first. so, I tried to wake all my friends who displayed that way shortly after updating this morning. I just got a note that one of my wake ups was successful, and I think the note said I'd get coffee and a gift. (sadly, I cleared it too quickly). turns out that I had a mystery gift show up on my invetory tab for chests, and when I opened it, it was a chihuahua. 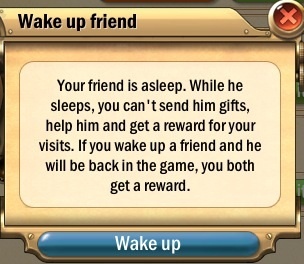 So, before you drop all your friends with pillows, go to your friend list and try to wake them first. they might get back. in the game, and you'll get a small thank you. kmnrc35 wrote: Not sure this is the right place to post this but was surprised how many people didnt know this....Clear your wall messages! After you gift requests X out the message. You will see more requests pop up that were hidden before because your wall was full! I do keep some from my daily friends because it makes them easier to visit but clear the rest. I had over 18 months of chit chat to clear when I found out about this! It took awhile to get rid of em all and now I take care of it on a daily basis. Hope that helps someone else. Oh wow I had no idea! Now that I've deleting for what feels like forever, how long do these msgs stay around? I.e. how many months worth will I have to delete? Sablesrgreat wrote: I don't understand the new gift icons, I have friends with zeros whom I know have sent gift so me and I to them. I am afraid they ar inaccurate and useless. I'm not sure how accurate the gift icons will turn out to be but I also have friends on zero whom I know have sent me gifts. I think it's because they haven't updated their game yet. My game crashed when I was collecting my gifts - went back in and everything was gone. I'm wondering if they are actually gone or if the game "collected" them for me? Is this a new G.I ploy to stop us using our giftboxes to save items we need for certain quests (i.e Zodiac ones) or to not collect chargers so you can request more the following day. I'll check to see if one of the gifts I know I was given gave a mystery gift in return or not. The same thing happened to me. I was given a collection item I did not previously have as a gift. I was in the process of looking to see gifts I received after I updated when the game crashed. When I reopened the game, the new gifts were gone, and they are not in my inventory. Boo! !